Thanks to @melaina25 for tagging me. I am loving rooting through other peoples fridges. Looking at the contents of my fridge is just that little bit scary at the moment. Oh yes, we have 6 people who live here (does that excuse it?). 2 x 4 pints semi skimmed milk, carton pure orange juice, bottle of pear sparkling juice, carton tesco long life double cream, 2 x cartons lactose free milk, bottle calpol, bottle chesty cough medicine, bottle of Benadryl, Tesco lighter than light mayonnaise and eggs. Elmlee cream, Hellmans mayonnaise, Very lazy caremalised red onions, garlic puree, carton tomato passata, sachet black bean sauce, carton lactose free milk, jar beetroot, Aero Bubble Deserts (sorry @kateab), 3 x packs lactose free cheese, cheese slices, mild cheddar cheese, cheese strings, pack puff pastry, kids smarties chocolate egg (honestly), cherry tomatoes, strawberries, wafer thin chicken, wafer thin ham, coleslaw, yoghurts, 4 packs tesco brussels light pate, 3 x dairy lee cheese spread tubs, lurpack butter, beef dripping, sausage rolls, pork pies, sticky barbeque ribs, mini savoury eggs, orange capri suns, remains of yesterdays sausage casserole, bottle of water, tub of cauliflower and irish cheddar soup, stork and tesco soft spread for baking, 30 eggs, 2 x soda stream bottles chilling, beef tomatoes, 2 x melons and a few apples. We do use a lot of eggs in a week, but there are six of us lol. Making quiche does take up a lot of them though..
Hi Scottish Mum; hope you’re doing OK. I think this fridge meme going round is so funny. Can’t believe you still have an uneaten chocolate egg in your fridge though – have the children not found it yet? 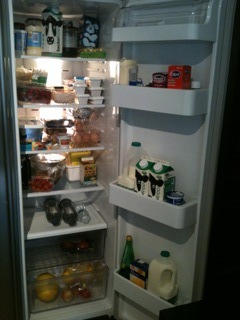 Anyway its a great fridge and I quite fancy that sausage casserole for my tea tonight.